Ticks are present in many parts of the world. Of approximately 700 tick species, most are harmless to humans. However, there are enough dangerous tick species to make it worthwhile to be well prepared when for example traveling. A tick that can give serious illness is the Australian paralysis tick. It was the paralysis tick that gave reasons for the first medical recommendations from ASCIA, that ticks shall be frozen to death before being removed. The ASCIA ( Australian Asian Society of Clinical Immunology and Allergy) recommendations were published already in the 90s and has had material impact on how to safely remove ticks. By killing the tick through freezing its ability to transfer dangerous substances (pathogens and allergens) is removed, and for example the very severe paralysis symptoms the paralysis tick could give are minimized. In the longer-90s became severe allergy to meat more and more prevalent in different parts of the world, notably the US and Australia. Professor Sheryl van Nunen began investigating the possible link between meat allergy and tick bites, and in 2009 prof. van Nunen with a publication where she established the link between tick bites and meat allergy. What Professor van Nunen parallel with his publication did was to reinforce the recommendation to always freeze to death ticks away before harvesting to reduce the risk of infectious agents transmitted and meat allergy develops. Professor Sheryl van Nunen is now one of the leading protagonists in the TIARA (Tick-induced Allergies Research and Awarness). Tiaras renowned committee of the immune lodges and allergy lodges are leaders in their fields. Together they advocate through recommendations, educational programs and publications that ticks always be frozen before they are removed. In the US and Europe are Borrelia burgdorferi is a disease spread by ticks and that can sometimes cause very severe symptoms. This is when the Lyme disease spirochete attacks the nervous system, joints and muscles (Neuroborreliosis). A number of doctors in France started freezing ticks to thereby prevent transmission of Lyme disease by picking off and thus reduce the risk of infection. The study published in JAMA (Journal of the American Medical Association) in 2013 with a recommendation to always freeze to death ticks before they are removed. 2015 came finally even educational literature in the field cryotherapy where freezing ticks discussed. Antick kills ticks immediately by freezing. This reduces the chance that the tick releases from the infectious substances when pulled loose. Once the tick is dead pulled fortress munorgan together and makes it easier to remove . People have a preference for different tick remover. Continue to use the removers you feel comfortable with. However, always freeze the tick first to reduce the risk that the tick transfer saliva and gastric contents when being removed. Ticks are carriers of infectious microorganisms such as bacteria , allergens and viruses . When live ticks can be pulled off the challenge they face result in regurgitation of saliva and gastric contents. In this way, various infections transferred from ticks to humans and animals. 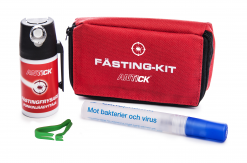 Antick Fästingfrysare based on medical recommendations to freeze the tick first. 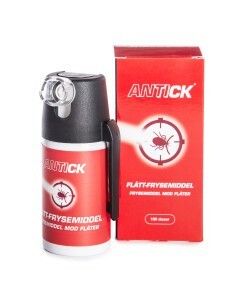 Antick kill the tick quickly by freezing, which reduces the risk of transmission of infectious agents. In addition, the tick lets go when it dies, which makes it easy to remove.